It is Friday. The second Friday of the new year. You know what that means? A and I are going on vacation!!!!!!! (This I tell you to firstly feel super jealous and secondly because A and I badly need this vacation). This being said, this will also be our last vacation before we get married, it’s like a pre-wedding-honeymoon-vacation. Sort of. A and I picked one of the furthest places from our wedding-destination, like the complete opposite of places you could possibly pick to go on vacation. It’s like going to ski Florida and to sun bathe in Boston. It might happen, but that is not the reason why you’d travel to the place you originally picked to travel. So now, we are heading to the most northern part of the world, that we could think of, already freezing by the sheer thought of it, Tromsø. Originally we planned to head even further north (Svalbard) but upon reading that you always have to be with someone who is carrying a gun, since Polar bears do come into the city, we decided that was just not quite our cup of tea. So we settled for Tromsø, for one simple reason: to fulfill A’s lifetime goal. Even the tiniest chance of seeing the Northern lights, that was enough to pack our bags and head up North. We left midday on Friday to Tromsø, a two hour flight away from Oslo and instantly were put in the land of never-ending darkness (well, not endlessly dark. But three hours of daylight is the reason why Norway is the world’s leading consumer of coffee). The realization is amazing, for about 35 seconds and then the cold sets in and all we could think about was “I want to go home”. We checked into our hotel, had some dinner and then decided to go into the woods, trying to see some Northern lights on our own since the sky was clear and we felt lucky. At about 6pm we left our hotel, here I want to note that I am not very streets-smart but I was smart enough to pack my rarely-used-skiing pants. While I was warm and toasty in amazingly warm skiing pants, A insisted he would be alright with regular jeans. Well, let me make this one, a short one: HE WAS WRONG. And I mean, so wrong, he was shivering all night. A and I asked the receptionist about where we could see the Northern lights best on a self-guided tour and she pointed towards a funicular about three miles away from city center. And being somewhat fearless travelers, A and I decided to get up that “fjellheis” (translation: mountain elevator). Remember A on a ferris wheel? Well, turns out, he is not much better on the fjellheis either. He grabbed my arm hard, his face white as a wall as he realized that the small loosley hanging metal box that we were about to step on was supposed to carry us up the mountain. After 3 minutes (A’s longest three minutes since the very last ferris wheel we went on) we arrived on top of the mountain. We were now in the immediate wilderness of the far north, at least that is what A kept telling me. Surrounded by a small café and a nice roaring fire in the open oven, it clearly felt like a survival-situation. 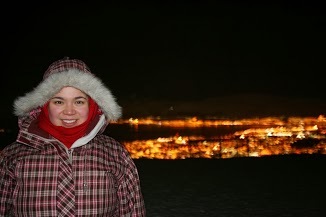 We stepped out onto a huge platform overlooking Tromsø City and it was breathtaking. A did not move much, he just stood there, in what I can only imagine his trembling fear of heights while I was dancing and prancing around. I am not overly fond of heights either but my curiosity gets the better of me. It was about 7pm and the darkness has already set its’ dark curtains over the city. The city lights where shining bright and the view was simply spectacular. My A’s and O’s were never ending, while A’s mumbling cursing got more and more frequent. Since A was almost immobile I decided to explore the rest of the place and quickly found the gem of the North. It was an endless field of snow, only lit by the few shines that the moon provided. I ran quickly back to A and dragged him out the other side of the café. A was amazed, stunned and speechless, but most of all A had watched way too many survival-tv-shows. He kept telling me to watch every of my steps and that the snow is not to be trusted since there could be crevasses hidden underneath. I had to remind him that we were not actually on a glacier but on a mountain and although I understood his concern, since the only light we could rely on was the moon, but I figured walking around a bit wouldn’t hurt. A was very carefully following me, making sure that he could not fall off anywhere. To make it easier on A I made him lay down next to me in the snow and we laid there for quite some time, starring into the dark blue sky, hoping for Northern lights to show up, but ultimately being together. That was after all what we were trying to do, get away from the craziness and be some place else, together. The problem though with Northern lights is, that you do not know where and when and if they show up. So we alternated our direction, making sure that we would look at every possible visible inch of the sky. We laid there for quite some time until we both almost reached popsicle status and then we moved around a bit and explored the snow mountain. Only then did I notice the intensity of the moon. Our shadows were even more intense now than they have been all day and I started making shadow puppets with my entire body. And let me tell you, being lit by the moon they look even more impressive. So, in case you ever wait around for Northern lights and the moon is shining bright, give it a go, it is at the least bit entertaining and keeps you warm. After that excitement had worn off and we had waited for hours and hours, hoping for lights that never showed up, we decided to call it quits. So around 9pm we decided we had enough of the frostbite and stepped on the funicular to return home. We got to talk to the driver of the funicular. Turns out he was from Brazil and he told us, that we should just wait it out a bit longer, we might be able to see the lights in about an hours time. He was kind enough to take us back up the funicular again and I am so proud of A for not freaking out, having to get on the funicular twice. He almost was comfortable on those cable cars. Only almost. But we only had another 30 minutes before the last cable car would go downhill. So we waited it out and hoped for some kind of sign of any lights. But unfortunately we weren’t able to see the lights that night. Upon returning down hill you could see the disappointment in all of the tourist’s faces. Silently we all got onto the cable car and went downhill. Shortly after the night turned into a complete nightmare. Just so you know, I am not good at all tired and on ice and fell about what seems like 7 million times on the ice, while being watched by a group of Asians that could not stop laughing (yes, it was hilarious, I imagine, the blue bruises the next day were also a lot of fun). We got on a bus, that took us to the city, but not quite knowing where we were going, we didn’t get off at the right stop and had to walk in the icey cold another mile or so, downhill on ice. Fun? No. Not at all. I do not good in snow. No. No. No. Eventually we made it to the hotel and shivered asleep shortly after. No northern lights, but that was alright, we were determined to try again, the next day. It was a pretty good day for the first day so far up north, no falling off limbs and A survived the cable cars but laying in the snow, next to A, enjoying a wonderful view of the sky, that alone was already worth the trip, even if we didn’t get to see one single light.